You don't need a warm beach in Brazil with our inflatable Beach Volleyball Court! There's no hard landings with our Bouncy Volleyball Court and the extra bounce may help you reach some shots that would normally be out of reach! 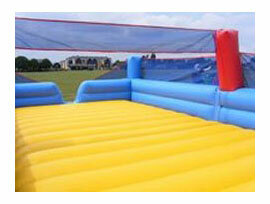 Our Bouncy Beach Volleyball Inflatable is essential entertainment for all beach and sport themed events. The inflatable volleyball court measures 52x25ft but you need to allow an extra 5ft all the way around it. The game can be operated indoors or out but you'll need a sports hall or similar if indoors due to the height clearance required. 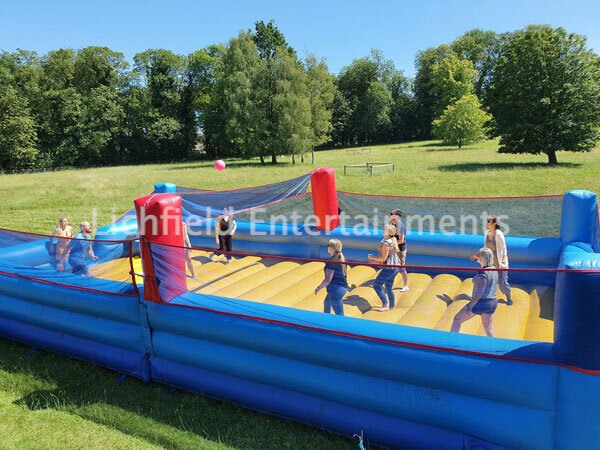 If you have any queries, questions, or would like to hire the Inflatable Beach Volleyball Court please click here to enquire and we will do all we can to help.